← What can be created from chaos? On Thursday, November 24th an eclectic group gathered at Eagle River Secondary School. We were there for the Blanket Exercise. This day had been a dream of mine for some time. Finally, it all came together. Using resources from KAIROS, a Canadian ecumenical peace and justice group, and ably led by teachers Heather MacDonald and Deb Hooper, about 40 students and 25 adults took part in an interactive educational experience looking at the history of First Nations and European contact in Canada. It is my belief that understanding and acknowledging our past can help heal our future as indigenous and non-indigenous Canadians. 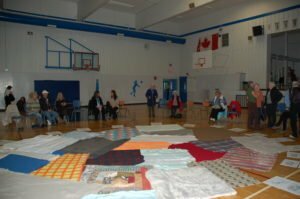 As well as two high school classes, most of the Sicamous United church congregation attended, as did other community members from Sicamous , Canoe, Salmon Arm and Tappen. The event was indeed educational, leading us through proclamations and laws that increasingly governed and disenfranchised First Nations people in Canada. This was graphically illustrated as the blankets we stood on, symbolizing the land on which First Nations lived, were folded smaller and smaller, leaving us feeling crowded, isolated, and decimated as people were asked to step off them – as victims of smallpox, or children taken to residential school etc. We ended the event by passing a talking rock around the circle, inviting people to share reflections on their experience. It was very powerful moment. We were choosing to build bridges instead of walls. I am deeply grateful to Mollie Folliott for all her work on this event, to Heather and Deb who led us, to Darryl from Splatsin who welcomed us to Secwepemc territory, to the Eagle River Secondary staff and students who helped it happen, and to my congregation for bringing themselves and good treats to share.